This week, the Times correspondent Anthony Loyd, and his colleague, photographer Jack Hill, were held captive in Syria. Antony Loyd was shot twice in the legs; both men were badly beaten. I wrote a piece for The Conversation looking at what the incident said about the hazards of finding help as a journalist in a war zone. You can read it here, and a version follows below (as does a photograph of me looking rather younger than I do now). It all happened so quickly I barely realised how much danger we had been in. The door had opened. The cameraman and I were immediately rushed into another room. We were told to remain completely still and silent. We were not supposed to be in Chechnya. Then, in early 2000, the region on Russia’s southern edge was a war zone. 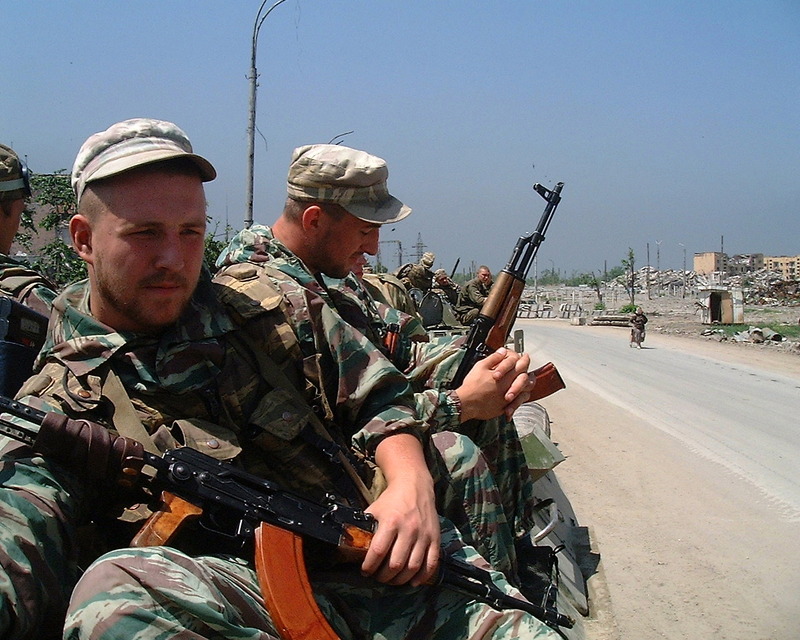 Russian troops had launched a major campaign against separatist fighters some months before. The Moscow authorities – presumably mindful of unfavourable media coverage of an earlier war – had declared the region a “zone of anti-terrorist operation”. It was closed to journalists. If you did manage to get in, as we did on occasion, you were on your own or, at least, in the hands of those you had hired to get you there. We had stopped at the house of a distant relative of our fixer. He had suddenly taken fright when another relative – a member of a local militia – also arrived for a visit. All I saw was the door being opened by a hand below a camouflaged sleeve. That’s when we were rushed out of the room. Our fixer had feared we might be kidnapped and held for ransom. Now we sat, waiting for the coast to clear. I wondered if I would spend another ten minutes in the room, or another ten months. I wondered too whether we had placed our trust in the right person. Had he perhaps actually brought us here to hand us over? The man left soon after. So did we. My fears were misplaced. But it was a lesson I have never forgotten in the impossibility of guaranteeing safety for journalists in areas of armed conflict. 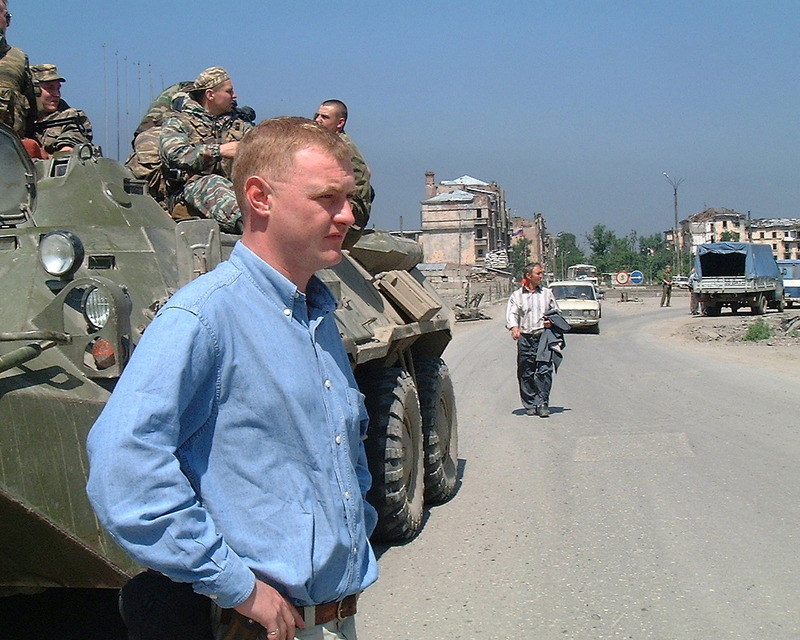 In Grozny, June 2000. This picture was taken a few months after the incident described in this post. The dangers then were real. A little over a year earlier, in late 1998, a group of telecom engineers from Britain and New Zealand had been taken captive in Chechnya. When no ransom was paid, they were beheaded. The recent ordeal of Anthony Loyd and Jack Hill of The Times is a terrifying example of the dangers journalists can face. The fact is that in war zones, in order to get where they need to go to tell a story, reporters often need to rely on people they barely know. In most cases, the guides, drivers, and translators want to help because the money is good, they genuinely want the world to know of their people’s plight, or both. Just sometimes, they see in a foreigner from a wealthy country the potential for an even bigger payday. I have met Anthony Loyd on a couple of occasions, most recently when we were on a discussion panel together in late 2012. I am not alone in considering him the best war correspondent of my generation. He, of all people, understands the potential risk. So why do it? Loyd himself wrote about this extensively in his book My War Gone By, I Miss It So. Anyone seeking to know what draws journalists to cover armed conflict should read it. For the past two decades, as journalists seem increasingly to have become targets in war zones, bigger news organisations have sought to mitigate the danger by offering hostile environment training. In addition to learning first aid, and how to take cover when under fire, these courses often include tips on how to behave if you are kidnapped. Ultimately, you may have to trust someone you barely know with your life. Anthony Loyd and Jack Hill’s escape has shed light on the risks journalists routinely take to get news from dangerous places to our newspapers and screens. We would all be much more in the dark if they did not. It was at this time of year in 1995 that I paid my first visit to the North Caucasus. As a student of Russian literature in the 1980s, the mountains at Russia’s southern edge had come to fascinate me, providing as they did the backdrop to one of my favourite books (it is to this day) Mikhail Lermontov’s Hero of our Time. It remains a marvel that such a book could be written by someone in their early 20s. He was to die in duel aged just 27 — a fate which could well have been that of one of his characters. My work as a journalist took me to back the Caucasus — northern and southern sides — on numerous occasions. One of those was to report on the visit of the International Olympic Committee to Sochi in 2007 as they sought to decide where to award the 2014 games. As the games get underway, I have published a piece for The Conversation on what is at stake in terms of security, and for the Russian President, Vladimir Putin. You can read it here. There’s also a second piece of mine on the site, about press freedom in Russia — where not everything is as controlled by the Kremlin as we are sometimes led to believe. It was terrifying news — if it was true. In October 2004, the Head of the FSB, Russia’s Federal Security Service, and the main successor agency to the Soviet-era KGB, told the Russian Parliament that more than 80 suicide bombers had been trained for attacks on targets inside Russia. The quotation above is taken from a BBC News website report published at the time. I was then working as editor of the BBC’s Russian language site. I remember a long discussion with my colleagues in the BBC Russian Service about how we should treat the story. We were wary of simply headlining what a senior official had said — just because they had said it. We had no obvious means of checking the claim. Nor would you expect him to — and that is the major challenge for journalists reporting on intelligence issues, especially where issues such as potential suicide bombers are concerned. Every journalism student or trainee reporter knows that a news story needs to have the 5Ws and the H: ‘Who, what, when, where, why, and how.’ The material available for many stories dealing with alleged terrorists often has more than one of those missing. In the case of Mr Patrushev’s remarks above, as so often, it is very important to consider the context of recent events. He was speaking the month after the massacre at the school in Beslan in which more than 300 people were killed. Russia was still stunned by the shock. Still, that was no reason for journalists simply to report his claims without first considering the basis for them. They should not be propagandists for the FSB or any other security service. Yes, Mr Patrushev’s remarks were newsworthy — but they might have been better placed in a piece about the security situation in Russia, rather than granted the immediate headline the FSB perhaps sought. More recent debates on issues of journalistic sources and security forces have focused on the consequences of the material leaked by Edward Snowden. When the head of Britain’s domestic security service, MI5, Andrew Parker, spoke earlier this month at the Royal United Services Institute, one part of his speech in particular (had reporters’ attention perhaps been gently guided there by helpful spin doctors?) generated the most headlines. ‘It causes enormous damage to make public the reach and limits of GCHQ techniques. Such information hands the advantage to the terrorists. It is the gift they need to evade us and strike at will,’ Mr Parker said, according to the text posted on the RUSI website. It made the lead story on the BBC Ten O’Clock News that night, October 8th. Both as a viewer and a former BBC journalist, I accepted that the speech was newsworthy. Of more concern was the way that Mr Parker’s remarks were simply reported, rather than analysed. Apart from a short contribution from Shami Chakrabarti, the Director of Liberty, the coverage mostly seemed to consist of what the MI5 Director had said. There are times when journalists willingly comply with requests from security and police forces. In July 2005, as police in London pursued suspects in a series of failed suicide bombings, broadcasters agreed not to show live coverage of the ongoing operation. The security services were concerned such coverage might alert the suspects to their impending capture. The real challenges that journalists face in reporting security issues are absences both of facts (those 5Ws and the H), and of secondary sources. Working with incomplete information can lead to errors of judgement. The relationship between journalists and security sources is in many ways a conflict — one in which both sides may sometimes do things they should not. From a journalist’s point of view, it is a conflict in which security forces, whatever their motives, should not be allowed always to get their way — or to reach a point where they dominate completely. The extent of the damage done by Mr Snowden’s revelations, or the extent to which they should be welcomed, is a different argument. The extent to which they should be reported is another argument again — although I think many journalists would say that, like the comments of the Chiefs of the FSB and MI5, the fact that they exist is a story.